Three months after I had my truck the motor blew out of it and it was a $6000 fix. Shortly after the motherboard for the front passenger window went out so we are currently taping up that window and both the back windows are hit and miss on if they want to work or not and the back glass window will go down but does not always go back up. Nissan titan works and plays hard. Very reliable vehicle. Runs smooth and has had no major issues. Has a seat warmer, seats adjust automatically for who is driving and alerts if tire pressure is low. Plenty enough power to tow and excellent for long distance travel. Super gas mileage. Seats 5 people comfortably with plenty of room. 2004 Nissan Titan great truck. Solid truck, no issues noticed so far. Seat material is a little thin and it is easy to shut off the lights on accident being the light switch is on the blinker handle. I do really like the hidden compartment on the rear driver side quarter panel. Everyone who sees it seems to like it as well. ON CERTAIN PICKUP TRUCKS EQUIPPED WITH A COLUMN SHIFTER, THE SHIFT LEVER ASSEMBLY FOR THE COLUMN SHIFTER MAY HAVE BEEN DAMAGED DURING ASSEMBLY. DURING ITS USE THIS COULD EVENTUALLY RESULT IN FAILURE OF THE PORTION OF THE ASSEMBLY THAT HOLDS THE LEVER IN THE PARK POSITION. THIS COULD RESULT IN A CRASH. DEALERS WILL INSPECT AND REPLACE THE SHIFTER. THE RECALL BEGAN ON SEPTEMBER 27, 2004. 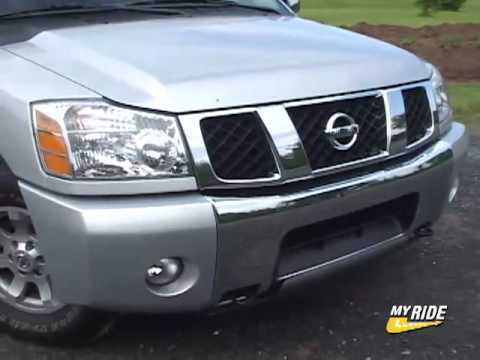 OWNERS SHOULD CONTACT NISSAN AT 1-800-647-7261.